How to choose WINTER wiper. In winter windshield drivers have to wash more often than in other seasons. Nezamerzayki in such situations it is consumed faster than any other technical fluids. At sub-zero temperatures stock washer for car owners simply need and this raises the question of how to choose the right freezing liquids without damage to yourself and your car. Do not be amiss to recall that the first washer fluid invented abroad at the beginning of the last century. In several European countries and America, the drivers are based on liquid methanol, which has no taste, color or odor, but it is very poisonous and toxic. To date, the consumer market filled with goods of varying quality, composition and price. 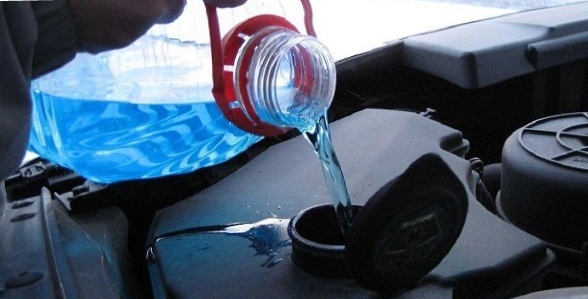 Washer fluid on methanol is illegal and often sold with a curb at a more affordable price. If you use methyl composition according to instructions, the driver and the passenger is not in danger but the perfect view of the windshield. And, use it for other purposes can lead to blindness or even be fatal. Nezamerzayki based on isopropyl alcohol is more expensive, it also copes well with the impurities and clears the driver’s view, but has its side effects. Because of the «native» odor of isopropyl alcohol, manufacturers frequently try to dilute it with different fragrances and dyes. This cocktail is not rarely causes allergic reactions in consumers. On the bottom of the dish should not be precipitate. The higher the percentage of alcohol in the composition of winter windscreen, the lower the degree of frost. Manufacturers often err incomplete filling of the alcohol, it significantly reduces the cost of the finished product, but on such factors as the impact in the worst way. You also need to know if you decide to try out the new washer, be sure to drain the old. Otherwise, the risk of getting a hellish mix can ruin the nozzle. Some adherents prefer hand-made produce washer fluid for the car with his hands. To do this, the course is the cheapest or «palёnaya» vodka. Homemade composition has a right to life, but it does have side effects such as damaged paint, sealants and rubber brush. Now count the value of the damaged equipment, add the price of vodka here and compare the resulting sum to the purchase of a package of quality nezamerzayki. What to prefer, it’s up to you, but remember that extend the life of equipment can only be a quality product.